Here we are. 3 months into 2015. Time flies. 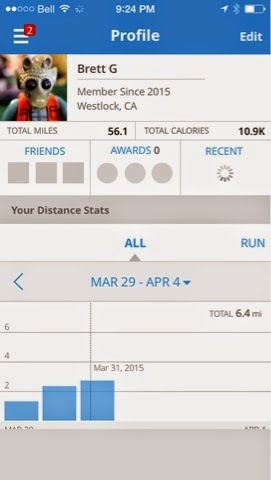 I ran 36 miles last year. A whopping 264 miles fewer than my goal. Fail. This year I upped my goal to 365. Here's where I stand thus far. So I'm still way behind, but I've got a lot of good weather ahead of me. That photo also makes my skin look a little peaked. I've gone a full 20 miles further this year than all of last year! For me, the point is that I'm still pursuing my new year's goal. To all the people who think New Years goals are dumb I say It was good for me to set a goal at the beginning of the year because I'm still at it. Hopefully writing this out in anticipation of my halfway report come July will add to the motivation for me to push forward. I would suggest that you set a goal and write about it to help hold you accountable, not to mention have a few good people to cheer you on. Wish me luck! And best wishes to you.